Tracking Smartphone Allows you to monitor your or your dependents mobile via this website. 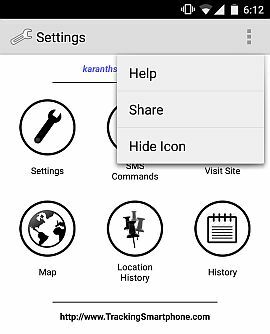 You need to install this app on the device which you want to track remotely. If you want to track your dependents mobile then you need atleast 5 min access to that mobile. Here are the steps listed to download, install and configure ‘Tracking Smartphone’ App on the device you want to track. 2. Once Downloaded, install the app on device. 3. Open the App and enter your ‘Email Id’. Make sure to enter valid email Id as login information will be sent to this id along with the password. 4. Enter Password in the next screen. 5. Once registration is successful, Verify Settigs to make sure all tracking is enabled. Call Recordings will be disabled by default, enable it if its needed. 6. Hide Icon if you do not wish app to be shown in app drawer. To do that click on top right menu in home screen as shown below and click Hide icon. To Unhide icon you need to dail *666* from normal dailer. 7. As a last step, disable security checks of apps from Google. If you dont disable the user might get a warning once in a while notifying user about a spy app in their mobile and asking them to uninstall it. To disable Go to Settings -> Google -> Security -> And uncheck “Scan Device for Security threats”. The location of this option might differ in other mobiles. 8. Thats it and you are set. Please note no information will be sent to server unless its pulled by user himself. And when user tries to pull data from device, the device needs to have active internet connection. You can use SMS commands to get basic information from device without internet. If you face any problem during installation or configuration do let us know in the comment box below. We will try to address it asap. How to use sms commands? on the setting for Tracking Smartphone theres nothing to click on the top right corner i instaled this apps to my wifes android to unhide apps *666* i wish theres a code to hide the apps…….this is one good apps……..
Hi Emerson, Maybe in old android version menu button will show the hide icon option. Do try it once and let me know. Hi Sathish, this is strange as we did not do any modification with the Call Recording part. Will check and update. Friend I mean I up graded my mobie to latest version nd the problem started. Plz do some thing about it. 1. Once the information is pulled from device to the server, does the information (call logs, sms logs, location logs etc) gets automatically cleared from the device? 2. Do we need to manually clear any log data from device periodically from the device so that it doesn’t keep occupying space even after data/information pulled to server? If so what is the way/method/command to clean the data/information from the device? Hi Feng, If you are pulling records regularly then no information in stored on the device. All files once pulled will be deleted from mobile. Only Call Records (if enabled) will be accumulated in mobile in a hidden folder and needs to be pulled regularly. After successful installation, l cannot see anything on the dashboard. My question is if l uninstall from a device can l re-install on the same device? l made more than one download but installed only one any effect on functions? No information is automatically pulled, you need to initiate command and pull it. You can install the app in any number of device with the same login. You need to select the mobile and initiate command and records will be fetched from that device. Is there another way to download and install the app? My android will not open .apk files. What error you are getting while opening the apk? You can also try and download WinZip and open the apk in WinZip app, that should also do the trick. App usually records 20s – 1min audio. Usually. But 5 mins and more audio is not recorded in the absolute majority of cases. And after sending a command (ie. Audio Recordings, Video capture or Pics capture) program finishes its work and phone user is informed about the crash app on the phone display. Which is not good. It is too bad. Device details, Contacts, Calls, SMSs, Locations, Browser history command seems work fine. Is it possible to treat these errors? even a small supplementary question… The Gallery Pics command scan only new pictures in phone gallery. Pictures captured before installing app are not send to the database. Maybe app sends only pictures stored in internal phone memory, but not stored in external memory (SD card). What algorithm is used to send Gallery Pics? Your comments are not deleted (No comments are deleted). You have commented on a different blog (http://trackingsmartphone.com/tracking-smartphone-description/) and i can see your comments. 1. Will check on the audio duration (of more than 5 min not getting recorded). I had not received that error before from anyone. 2. Regarding Gallery pics, the app after installation for the first time sends all pics (including old) to the server, after that it sends only the new ones. If you delete the old pics from server you might not get them again as uploading all pics everytime will require huge space on the server. 3. We handle most of the crashes and its not shown on the mobile but some system related crashes cannot be handled and shows up to the user. I understand this will expose the app, will check if this can be fixed as well. The app is detected by CM security as a virus. Unfortunately many Anti-virus app detects it as Virus as the app does too many things in background. The mobile can also be controlled via SMS so its obvious that Anti-virus will try to flag it. But dont worry, your data is safe in server and its uploaded to our server only when you login and initiate command. and another thing i download it to galaxy s5 but sad can`t open file?? If it says ‘Cant open file’, request you to download WinZip app and then open the app in WinZip and try to install. I tried this in one mobile and it worked. can i track an another phone ?? After reboot the mobile application not send any Logs. Have you disabled Security Scan by Google? After reboot Android scans for Spy apps and prompts user to uninstall it. I guess this must have happened with that mobile. Please wait while we route your call to the next available support person who will help you with your question: “Well does not work , received no call recording Why give it always requires the activation Please help and Improvement . Hi Mime, we do not have a phone support as its only me who is developing and managing this app and its not possible to give phone support. But i didnt get your first line, you must have called some other Site’s customer support. It would be great if you could rename the app because when its installed into the phone it shows as call recorder with the icon in the settings > applications > call recorder. Everybody can get to know and it defeats the purpose of being hidden. The icon is not there on the tray but if checked in settings blows the cover. TrackingSmartphone app shows as “Remote” in the app settings list. Call Recorder is a different app. Is this application completely free? Or is it chargeable after some time? Its free. No charge whatsoever. Hi there. As of recent, in an Android L, a phone often displays a notification about spyware being detected, pointing out that it’s the remote app. Can you sort that out? Thank you! App shouldnt consume battery as it doesnt run all the time in background. It runs only when there is a call or there is request for pull from server (by you). is there any countries that are blocked from accessing the server ? because I live in syria and every time I try to open the app to register and set it up .. it’s keeps saying ( loading . please wait… ) and then it asks me to check my internet connection!! although I’m sure my connection is fine .. all the other apps are perfectly connecting and working ..!! Hi Eias, App is not blocked from our side. The loading during initial setup is to get GCM Id (Google Cloud Messaging ID) and it keeps loading until we get an ID from Google. And Google seems to not issue an ID for some region. Will try to investigate and fix it. does call record work on samsung s6 edge? Hi Srihari, I am keeping a large hope on your app which I wish going to help me to monitor one of my close relative’s calls recordings. That person uses CDMA MTS connection in India, therefore I have to buy a new CDMA based android phone. As you know in India there is a very few options for CDMA users to choose from android phones. In case of mine I found HONOR HOLLY 2 PLUS is good and Second option for me to buy USA imported verizon network based unlocked CDMA AND GSM based LG G3, SAMSUNG S4, S5, MOTO G 1st GEN, MOTO X 1st GEN. They uses some software to unlock this phones. Now my question is have u tested your application on any of this imported unlocked phones, will there be any software conflict? Did you test it on HONOR HOLLY 2 PLUS ? Or which phone you recommend me to buy to successfully use your application? Please reply soon I am in a very big mess. Thanks for your time to read this out and awaiting for your reply. 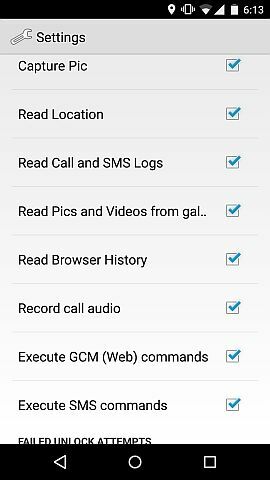 Is recording of calls enabled on phone’s app settings. That one feature is disabled by default. I have mailed you regarding my problem, could you please reply? Because I cant post comment here. It says waiting for moderation and later delets my comment. I must say I’m shocked – This is an awesome app! still can’t believe it’s free – I’d be happily paying for it ! it competes quite nicely with the so-expensive commercial apps. I’ve been using the app for a few days installed on my son’s samsung 5 note phone – all great except the fact that I get only short call records uploaded and the same for audio recodings. anything up to one minute works well but longer calls or audio recordings do not make their way to the website though I can see them in the hidden folder on the phone. I think it would be a great feature to “force upload all files from the folder”. I can see this has been reported by previous users as well – is that a known issue being tracked on your end? Honestly That’s the only thing which stands between a great app to a perfect app – I’d be willing to pay for that fix! once again – awesome job mate! Thanks for letting us know about the issue. Will fix it asap. does this app support samsung galaxy s7 and android version 6.0.1 ? also is there a way that the logs come automaticly every x minutes/hours instead of sms commanding ? The problem with doing an automatic pull is that if many install and forget (as the app is hidden in mobile its easy to forget that its installed), the server would be loaded with too many data with many not even knowing about it. also is this app still free ? i found a pricing page ? App is free. You must have seen in some ad i suppose? Your app is working great thank you. My question is: is there a call recording limit at the dashboard? I mean do I need to delete all the call recordings from the dashboard list? All contents will get deleted automatically after 60 days. So kindly keep a backup if its important. Plzzzz add live call listening feature if possible . i installed the app in Samsung j7, the app does not automatically hides its self and plus if freshly installed it will only pull the data for a day or two then does not pulls the audio call records neither the audio record feature works rest of the features are ok, if uninstalled from the phone and re-installed again then same story again a day or two pulls the audio records then nothing, please advise if there is a setting i am missing. Having an issue, when I go to download the files over the last couple of days, it tells me its forbidden? it just started doing this like 2 days ago. In Chrome and Firefox it will throw Malware alert, there would be a link somewhere to ignore the warning and proceed with download, Else download from some other browser. After using the app for a few months now i found some errors that i wish it could be fixed. 1) Recorded Videos : Some of the recorded videos once uploaded to the server stays on the device and could be seen in the gallery. 2) Capturing pictures : Same as recording videos but worse, all the pictures taken stays on the device. 3) Gallery pictures : A lot of times the command of getting the pictures from the device doesn’t work although the other commands does work. 4) Logout : The app keeps logging out every now and then and i need to access the device to login again and set everything as it was. I’ve tested it on Galaxy S3 and Galaxy S2. Thanks for the list. We are updating it with a new version, will try to have a command to pull leftover files on the device that would be good. Blocked by? If its blocked by anti-virus then u might have to disable anti-virus during install. There must be some button hidden somewhere to proceed with installation. What error you are getting? Are you sure its not deactivated? you can write to us at srihari@TrackMyPhones.com with your login id, will check if its active in the system or deleted. I cannot access my app anymore. I forgot my pin and when i try to click forgot password it says im not registerd and i did register and i was monitoring my boyfriend. What could have happened ???? This is fixed. You can now get your password. Check and let me know if you still face any problem. Hi srihari congrats on your apo popularity its really awesome spy app . How can I uninstall it from the phone please? It’s not showing in device adminstration options.. Unfortunately some security apps detect it as malware as it can be used for spying purpose. Request you to mark the app as safe if there is any option. How to uninstall tracking smartphone apps ? In my device not showings apps also not in settings apps installed application. Open the app and select “Remote” and click Uninstall. Dear sree hari,this app can deactivate and uninstall from devise administrator settings.can you fix this. Work very bad on my Xiaomi Redmi Note 4X with Miui 9 Global 7.8.10 beta. The app accepts web commands randomly and often crashes. Hi , i’m waiting for the notification with passwords , does it takes several minutes to be sent ? Notification with passwords? Sorry i didnt get. Do you mean registration mail ? It will be sent instantly. 1. go to Settings -> Apps and Look for app called “Settings” and Uninstall. 2. Go to Settings -> Google -> Security -> and disable google security scan. You need to select the device from right top and then fire commands. else the commands will be send to the device already selected. This stopped working when my phone was updated to android 9. Did a complete delete and reinstall now It will not download on android 9. Will no go past the load screen to enter my registration information. Its fixed now. Request you to try again. 1. Memberikan perintah smartphone untuk hidup walau oleh pengguna smartphone itu dimatikan karena baterai lemah lalu lupa dinyalakan. 2. memberikan perintah smartphone melakukan panggilan sms atau telepon ke kontak kita atau orang lain dari jarak jauh yang artinya bukan pengguna smartphone yang terinstall tapi kita semua yang melakukan dari server. 3. memberikan perintah untuk membuka aplikasi tertentu yang sudah terinstall di smartphone pengguna, difungsikan agar bisa dilacak posisi gmaps pengguna (untuk anak agar lebih aman). Mohon dijawab sahabat, sebelumnya saya ber terima kasih dengan ciptaan yang begitu hebat ini, berkah hidup anda. 2 and 3 is possible. 1 is not. 2 dan 3 dimungkinkan. 1 tidak. I installed it right step by step but when I try to test it. Won’t work. Could it be blocked and how to fix it plz. I disabled play store and google so they wouldn’t be able to block it. Whats not working? Were you able to install it and register? Did you try some basic commands like vibrate?